What Is I Ching Hexagram 32 All About? 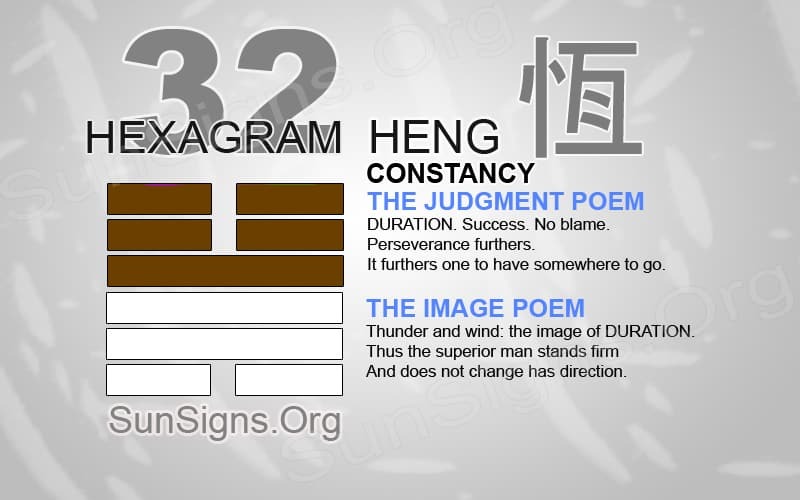 Heng is the Chinese name of the I Ching Hexagram 32. The inner and outer trigrams form thunder over wind. People call this Hexagram ‘constancy’ or ‘preserving’ or ‘duration.’ Hexagram 32 yijing symbolizes the constant change in life. It also shows how being adaptive to constant change is the only way to ensure progression. All things in life are temporary. And at one point or another, a change will occur to alter the direction of the life path. To survive change, an individual must be able to adapt to all types of changes. Hexagram 32 symbolizes the constant change in life and how nothing will last forever. Maybe, in the past you have used certain methods to deal with the constant change. But, in the future they may not work and thus the need to adapt to survive. The flow of life is constant. It does not stay still and never stops. There are slower periods than others. Just like a river slows down in the winter, it will rage again once spring begins. The flow of the river never stops. And, neither does the transition of time and life. To survive each season of life, an individual must be able to accept change. And they must move with the flow as well. Nothing in this world will last forever. That does not mean that all good things will come to an end. But it means that there will be some form of alteration at one point or another. There are ways to deal with life changes. Most changes are unpleasant but necessary to progress. Mistakes might cause a change or a loss of a loved one. These negative changes take great strength to move on and determination to see them overcome. I Ching 32 says that one method of dealing with change might not work in all situations. Being strong and clear-headed during a difficult change is ideal. But sometimes, emotions must run through their course to find closure. If we hide away deep emotional feelings, then eventually they will resurface at an unlikely time. I Ching 32 divination says to strengthen a relationship, a change will occur to allow this progress to commence. To think that young love that is adventurous and exciting will last till death is unrealistic. That does not mean the relationship can never return to those stages again. It just simply means that a relationship can be strong and deep with understanding as time passes. It will be a different time in the relationship. But, with all change, several possibilities will arise. I Ching 32 says that at other times it is a new business opportunity or a renewing of love. This will bring a positive change in life. No matter what type of change, you must accept that life is taking a new direction. If you force change away, we will not be able to survive what life has in store for us next. Dealing with problems as they occur to move past them is ideal. Closing one door halfway to venture through another will only allow a dark past to come chasing after us. Thunder and wind: the image of DURATION. Hexagram 32 speaks of the constant flow of change. So it is important to be aware of the current change in life. It is reassuring that all difficult times will pass. With a constant flow of time, we might make a mistake. Time allows the opportunity to overcome a mistake and appear renewed in the end. Be able to move with change. Do not remain stagnant to survive all forms of evolution.